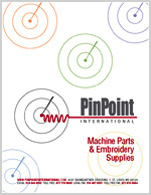 Slim Line 1 & 2 Clamping Systems - Primarily used on single head embroidery machines. The Slim Line base unit attaches directly to the drive bar/drive rail of the embroidery machine. The clamp stays on the machine while preparing or removing embroidery items. Changing window sizes is quick and requires no tools. Window sets come as a 3 piece set including 1 base plate adapter and 2 top windows, one window for thin material and one for heavy-duty material. A single lever opens, closes and locks the clamp. The spring loaded clamp automatically adjusts to fabric thickness. Use on purses, lunch bags, knit caps, Christmas stockings, straps, pockets and other smaller, hard to hoop items. Mounting adapters are available for most major industrial embroidery manufacturers and machine types.